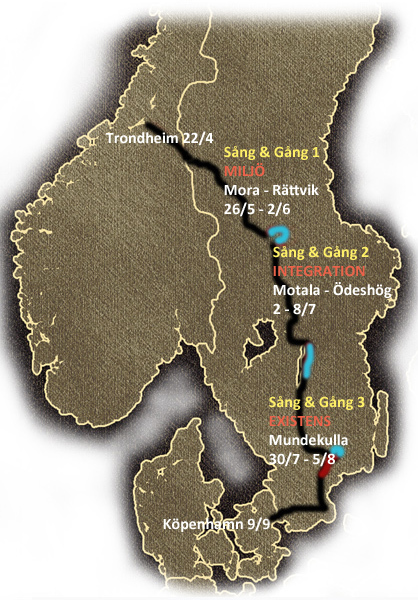 The complete walk takes 18 weeks starting in Trondheim April 22 and finishes in Copenhagen September 9. It works like a relay where the walking stick and the songs passes from person to person (group to group) along the way. Some weeks are open for all to join (see below) where 25 participants can walk along. Food and simple acommodation is included in the price. We walk 15-25 km/day and every sunday is a resting day. The weeks are available for booking on the 15 th of feb.
-Three weeks are “blue weeks” (Song walks) where we apart from walking in beautiful landscapes also offer singing workshops and events, concerat and/or seminars. These blue weeks have one theme each, such as Mother nature, Integration and eXistence and the theme for the final concert in Copenhagen is M.I.X where we summarize and mix the expariences along “the path”. -Two weeks are “red weeks” (Walking week) which includes daily walks but without the concerts, workshops and seminars that are being offerd on the blue weeks. -The rest of the weeks are “black weeks”, which are being done by “the Path organization” itself which are not available for booking. They might be upgraded to “red weeks” later but at this point they remain “black”.